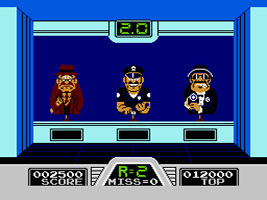 Shoot the bad guys and spare the good guys on the shooting range using the NES Zapper. 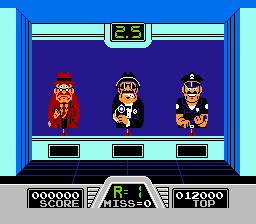 In each round you must shoot all the gangsters while avoiding the civilians and police officers. You only get a limited time to shoot before the next line-up appears. As you advance through the rounds, your time limit decreases. Three cardboard targets appear and turn around. You have to shoot the villains within the time limit. If you shoot the civilians, or fail to shoot the villain in time, then you lose that round, and the next round begins. The screen scrolls through a mock up of a town. Criminals and civilians appear from doorways and behind obstacles. 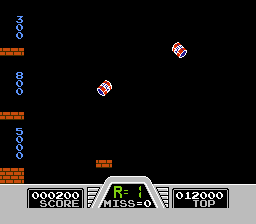 Cans fly onto the screen. Shoot them to keep them up in the air, and guide them onto the platforms for points. 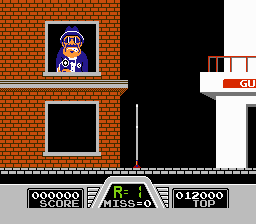 Each platform is worth a different amount of points, and you also gain points for keeping cans in the air.